The merits of using social media campaigns in business are hard to deny, but they also don’t always seem perfectly suited to every business in every industry. If you’re struggling with how to use social media in your prospect outreach because your audience seems unreachable, keep reading. Here’s a look at a powerful story of how NetApp and Cisco, along with partners, overcame similar challenges in order to increase FlexPod’s digital presence and engage with its technical audience. Initially, the challenges seemed plentiful. For one, the audience we wanted to reach included engineers, architects, and executives, none of which are historically avid social media users. Furthermore, FlexPod is a leading converged infrastructure solution, so buyers are generally well-educated, highly technical individuals. The quick and informal nature of social media doesn’t naturally lend itself to this type of material, so there was a further challenge in figuring out how to make this work. 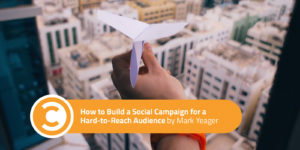 NetApp and Cisco partnered with our team at Yeager Marketing to create a compelling social nurturing campaign, adding in Mercer-MacKay Digital Storytelling to support content amplification through FlexPod’s Twitter channel. Our team ended up delivering the FlexPod Brainteaser Campaign, resulting in the highest-performing campaign in both Cisco and NetApp history. In a span of eight months, ten posts generated over 900,000 impressions and over 8,000 clicks across three main social channels: LinkedIn, Facebook, and Twitter. Here’s how we did it, so you can apply similar principles to your biggest social challenge. So the team at Yeager Marketing dove into the messaging around FlexPod and worked to find out what would gain the attention of this particular group of prospects. Since all members of the target audience were in problem-solving roles and generally proud of their knowledge level, our team landed on the word “smart” as a focal point. We decided on a Brainteaser campaign that intrigued visitors and piqued their problem-solving nature. Each brainteaser was attractively designed and included a compelling call-to-action like “Solve the Mystery” or “Your Challenge” as the title, hitting on the one thing that most of these engineers, architects, and executives would have a hard time turning down (solving problems). Once users clicked on the brainteaser, they arrived at a landing page that provided the opportunity to download additional FlexPod resources. Cisco and NetApp also made the decision to give a donation of $1 per opt-in they received to the One Laptop Per Child organization. They did this to reinforce the companies’ commitment to giving back and to encourage more opt-ins by supporting a worthy (and relevant) cause. The brainteaser content was effective on its own when distributed through the NetApp and Cisco social media channels. However, our teams wanted to make it easy for employees and partners to extend the reach of all these materials. To do this, we developed an email nurture campaign that included one-click sharing capabilities. We also made sure to equip all salespeople, alliance managers, and the FlexPod partner ecosystem with good content to help establish themselves socially and position themselves in an authentic way as subject matter experts online. The targeting of the content, crafted specifically to cater to the minds and penchants of the desired audience, is largely responsible for this impressive response. All of this propelled the FlexPod Brainteaser campaign to receive a finalist spot in the Killer Content Awards 2016 and in the Cisco Marketing Velocity Awards 2016. It’s also a testament to the fact that even audiences who are traditionally hard to touch on social media can be reached, powerfully, when targeted with niche content and intentional amplification.